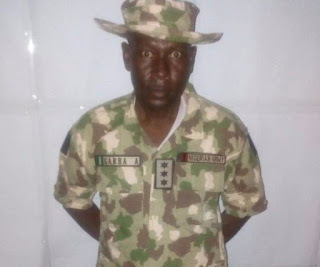 Abdullahi of 159 Battalion, Nigerian Army, to the rank of Captain. A statement from director army public relations officer, Brig. General Sani Kukasheka on Thursday, said the accelerated promotion was due to observed outstanding qualities of military professionalism, such as gallantry and dedication to service demonstrated by the Non–Commissioned Officer. “Garba Abdullahi’s leadership qualities endeared him to his Commanding Officer who deemed it fit to assign him a higher responsibility as platoon commander of one of the arrow head sub-units of the Battalion, the role he played excellently to the admiration of both his superiors and subordinates alike. “Under his able leadership, his platoon achieved great exploits of daring, bravery and courage for which the Battalion was reputed. “The 159 Battalion is of one the rugged and most experienced cohesive fighting unit that make up Operation LAFIYA DOLE. The Battalion covers five Local Government Areas in Yobe State and serves as the Brigade’s first line of defence in the northern front adjoining Niger Republic and Borno State. “The Battalion primarily occupies a blocking position from where it conducts Counter Terrorist and Counter Insurgency operations to defeat Boko Haram terrorists, deny them freedom of action and assist the civil authority in maintenance of law and order and restoration of socio-economic activities within its area of responsibility. “Since their deployment into the theatre about two years ago, the unit has contributed immensely to the decimation of Boko Haram terrorists and also involved in humanitarian activities to the host communities. “The elevated Garba has played a significant role in all the successful operations achieved by the unit. “The newly commissioned Garba Abdullahi has since been decorated with the badge of his new rank of Captain at the Battalion Headquarters located in Geidam, Yobe State by his Commanding Officer Lieutenant Colonel Owoicho Augustine Obochi, to the admiration of both officers and soldiers of the unit. “The Chief of Army Staff, Lieutenant General TY Buratai has congratulated the newly commissioned officer,” the statement read.